I have been deep in the forest this week painting owls for Art Journal Journey’s October theme. These two are having a great old gossip about the naive little fairy that noisily woke them up from their slumber. They were very indignant when she screamed out as a spider jumped on her wings. What was she doing there anyway, they asked each other. Well, Miranda was being brave, very brave in fact. The big fairies told her that deep in the forest there was a wonderful treasure chest by the old oak tree. In it there was a lot of special fairy dust. Now this fairy dust was wonderful - beautiful iridescent blues and greens with gold and silver highlights. 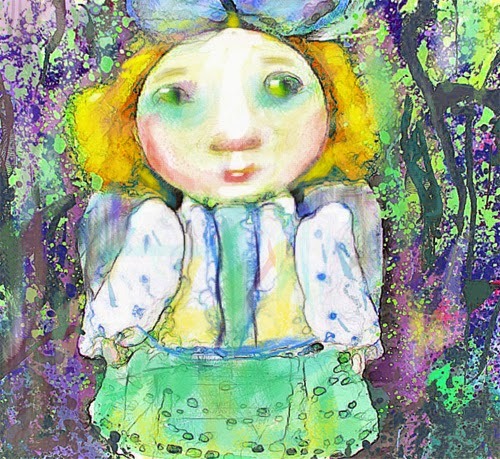 Miranda thought that if she could get some and made a wish she would become beautiful and slender like the big fairies. The spider terrified Miranda and when the owls hooted with laughter, she decided that she didn't like the darkness of the forest and perhaps it would be better if she went home and ate the pear her Mum was painting for lunch. Pears would make her skinny!!!! Also her Mum’s kitchen was full of light and warmth and love. The owls were done in ink, pencil and watercolour. Miranda was done in pencil, watercolour and gouache. 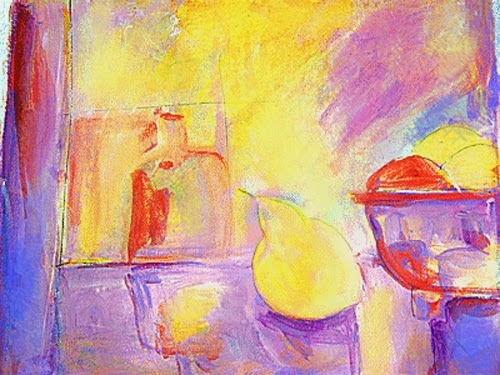 The still life was done in acrylic, it is also being linked to Mix it Monthly hosted by Conny, where the theme in October is still life with the colours red, blue and yellow. Have a wonderful creative week and thanks for visiting. All three pieces are just AMAZING Sharon! I love Miranda and the story ! Thank you for joining DEEP IN THE FOREST ! 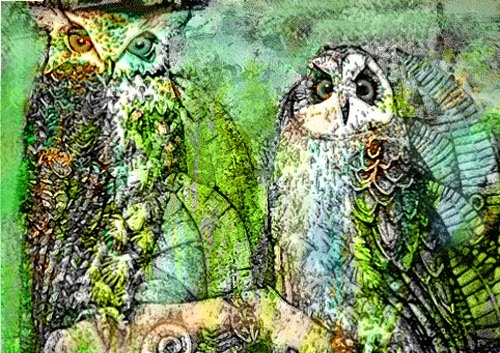 Loved them all...the owls look so wise, and Miranda so naive is all her glorious color!! Great story and pear painting! This post is gorgeous! I can't decide which is my favourite of these three paintings, each so special in it's own way! Your work is a delight, from that bright still life that glows with light and warmth and that pretty little fairy, so authentically beautiful to your wonderful owls, I love these birds and yours are exquisite and have such character! Your story goes so perfectly linking these pictures so well, thanks for sharing all of this! Great paintings, Sharon. Love the owls. fun story-and great paintings Sharon! Beautiful journal entries and I lovelovelove the story! painted wonderfully the owl's picture. The style picture with these colours fantastically! The picture girl is so lovely..
What expressions on the owls' faces, absolute outrage, oh yes they'll have a good old gossip. This is such a beautifully illustration, right out of a vintage story book, it looks like an etching. Miranda is delightful and I hope she enjoyed her pear which is also delightful. What a magical, entertaining and fabulously artistic post, Sharon. lovely and varied assortment today! I loved looking at your wonderful art and hearing the fairy tale. I just love a good fairy tale! How did you guess. I have been experimenting with wiping a very thin layer of paper clay onto board and letting it dry, because it shrinks and cracks it creates a wonderful surface. Although it can be hard to draw on so you have to let the surface decide what is going to happen. So wonderful, gorgeous paintings. Love! Enjoyed the whimsical style. Lovely creations! All three are just wonderful--but my favorite is the owls! They made me smile. You are SUCH a talented artist. I think I would pick out your style anywhere. Wonderful!